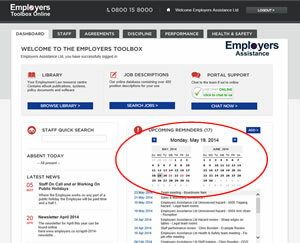 Upon logging in to the Employers Toolbox Cloud service all users will see the Dashboard now has a calendar showing the upcoming 2 months. Any alerts or scheduled events for this period will be showing in here. Upcoming Performance Reviews and all scheduled Health & Safety events such as Hazard assessments, staff & equipment training, equipment inspections and team meetings will automatically appear in here. In addition to this users can now add their own alert items. Clicking the 'Add' button to the right of the calendar will offer an interface to schedule an alert and optionally be emailed about it. Items in the calendar will be showing in the list below the calendar and are clickable to take the user through the respective page where the scheduled item is managed. All items in the calendar whether automatic from the system or manually entered by the user are optionally emailed to the registered email address on a weekly basis.